Confidently display your logo with this stylish duffel bag. This bag is made of high quality recyclable, eco-friendly, biodegradable, 12oz 100% cotton canvas with recycled content. It’s the perfect addition to any day outside in the sun. This is a great bag for hotels, or country clubs. The bag comes with a convenient wide slip pocket and can be carried on your shoulder. 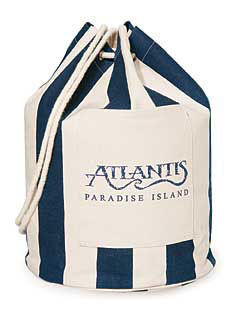 With your logo imprinted or embroidered, the bag is perfectly suited for gifts or giveaways.